Can you reconcile without forgiving? “W hat is forgiveness? Can you reconcile without forgiving?” this was the opening question of our last session after a four weeks Symposium. 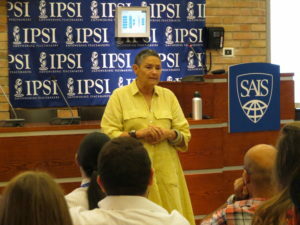 Robi Damelin stood there listening to our “scientific” answers inspired by the philosophy of conflict resolution that we’ve been dwelling on during our workshops. But we had forgotten that reconciliation and forgiveness belong to two different worlds. One is governed by the brain whereas the other lies within the heart. And while the brain can be swayed by reason, the heart only speaks the language of the soul. The topic of the session was “dealing with trauma/ personal reconciliation”. We were expecting an Israeli to come and tell us about how she lost her son in the Israeli-Palestinian conflict and about the process of reconciliation she went through with the perpetrator. However, what happened next is something we did not see coming. A series of videos about the Families Circle (the organization that brings families from both sides of the conflict that have lost loved ones) and a couple of rounds of self-reflection brought the whole class to tears. I don’t think that the drama in the videos was behind this burst. In fact, for a month, we had been discussing the problems of the world, the conflicts, the injustice and the undermining of the human value. And truth is, after this symposium, we’re going back to our countries with a toolkit of peacebuilding; some of us are going back to conflict havens and others to less dangerous areas. Just a couple of days ago we were participating in a final simulation. It was about Beladusham, the fictional version of Syria, where we were brought back to 2013 and put in the shoes of UN ambassadors, NATO representatives, the “Beladushami” president and political leaders of the opposition as well as activists, journalists and other regional actors in the conflict. And between mixed feelings and personality crisis, reality aroused. In a fictional state, actors were real and tensions were authentic. We were fusing our characters’ needs and interests with our identity and negotiating for our states’ interests. 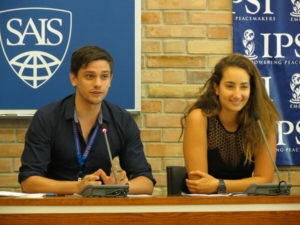 We were trying to bring in all the skills we’ve been learning, from R2P and nonviolent activism to negotiation skills and med iation, with the burden of human atrocities and imminent ISIB (Islamic State in Iraq and Beladusham) genocides on our shoulders. Two days of continuous talks followed by Pamela Aall’s feedback were mentally and psychologically draining. Nevertheless, they were an eye opener. Why is Syria submerged today in this vicious cycle of war? Why did the world leaders fail to reach an agreement to stop the conflict from taking this futile turn? Too many actors, conflicting interests and political and national greed were put ahead of the most important priority: the dignity of human beings. However, these leaders are human, and humans make mistakes; but sometimes failing to make concessions leads to unforgivable mistakes. So the question remains: Can we forgive them? If we ever reconcile with the perpetrators will we ever find enough love in our hearts to forgive their irreversible mistakes? We are all human beings, with our own pasts, struggles, families, hobbies, passions, emotions and weaknesses. We want to make a change in this world because we are tired of witnessing injustice and standing still. Many times, doing nothing is more harmful than failure in intervention. And so we were one soul in the SAIS auditorium yesterday, one big family longing for peace in a world where love is struggling to plant its seeds. I hope our tears sent a prayer to world. Because you see, we are the seeds of love. We are the change. And where there is will, there is power.